Some of us find online computer games to be a good way to keep our brains from atrophying when we are disabled by all the toxic chemicals allowed to be used in everyday products and materials. It would have to have an adjustable, variable speed (some of our brains are very slow), as well as an on-off switch for sounds (some of us are also sound “sensitive” when our CNS has been fried from exposures). The products that pop up can be virtually all regular laundry, cleaning, and personal care products, pesticides, new clothing, shoes, furniture, new electronics, most plastics, in fact, almost anything new. Toxic, health-harming petrochemicals are everywhere now! The game could be turned into an educational tool too (instead of just a therapeutic tool) by including hyperlinks that inform what the known and suspected to-be-harmful and still-questionable chemicals are in each product, and what health effects they can cause! 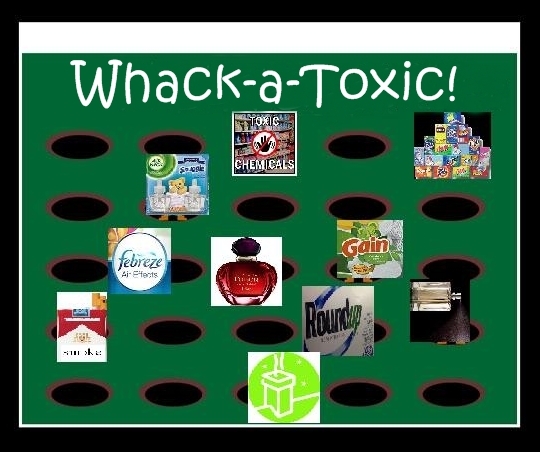 Scoring could be based on whacking (eliminating) the most toxic products first! Can someone please make us this game? This entry was posted in Action, Brain, Chemicals, Environmental Health, Environmental Sensitivities, Products and tagged computer, games, ideas, MCS, mind the store, online, programming, toxic products, whack-a-toxic. Bookmark the permalink. Love this Linda! There’s a serious side to it all but this still made me laugh. Grab a mallet! Get a toxic product off the planet!